Don't Pray About the Book of Mormon? Many critics of the Church of Jesus Christ of Latter-day Saints encourage people not to pray to find out if the Book of Mormon is true! Is Moroni's promise at the end of the Book of Mormon wrong? Does the Bible agree with these critics or with the prophet Moroni? Find out in the article below. 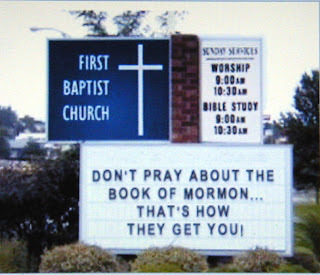 Recently my brother-in-law posted a picture on Facebook of a sign at a church that read "don't pray about the Book of Mormon . . . that's how they get you!" Though I have seen and laughed at this sign many times before, this time I felt a need to address this topic. Even if the sign had been photo-shopped, the sentiment has been expressed in my conversations with critics and pastors of other churches in the past. "Behold, I would exhort you that when ye shall read these things . . . and ponder it in your hearts . . . I would exhort you that ye would ask God, the Eternal Father, in the name of Christ, if these things are not true; and if ye shall ask with a sincere heart, with real intent, having faith in Christ, he will manifest the truth of it unto you, by the power of the Holy Ghost." (Moroni 10:3-4). What problem could the critic possibly have with this statement? If something claims to come from God and you don't know if it does or not, praying to God would be the logical choice to find your answer. The problem for the critics of the LDS church, is that this promise has been fulfilled so many times by the Lord. These critics try to discourage people from joining the Church of Jesus Christ of Latter-day Saints by teaching them not to pray to know the truth! Should we Read, Study, and Pray to know Gods truth? Prove all things? Like the Book of Mormon? How would one quench the Spirit? If you didn't pray and seek God for an answer then wouldn't the Spirit surely be quenched? Why do we need to Pray to know God’s truths? "But we speak the wisdom of God in a mystery, even the hidden wisdom which God ordained before the world unto our glory. Which none of the princes of this world knew: for had they known it, they would not have crucified the Lord of glory. But as it is written, Eye hath not seen, nor ear heard, neither have entered into the heart of man, the things which God hath prepared for them that love him. But God hath revealed them unto us by his Spirit: For the Spirit searcheth all things, yea, the deep things of God." (1 Corinthians 2:7, 9-10, emphasis added). The critics seems to be fulfilling Paul's warning by convincing others that it is foolishness to pray for the Spirit to reveal God's truth. Here we can see how important seeking the Lord was in Israel's search for the truth. When they were without the true God, without a teaching priest, and even without the law, how could they seek the Lord? They would find him in prayer! In Jeremiah the Lord explains the important role prayer would play in their search for truth, "Then shall ye call upon me, and I will hearken unto you. And ye shall seek me, and find me, when ye shall search for me with all your heart. "(Jeremiah 29:12-13). If Christ promises to answer our prayers, would that include knowing whether the Book of Mormon is truth? "And whatsoever ye shall ask in my name, that will I do, that the Father may be glorified in the Son. If ye shall ask any thing in my name, I will do it." (John 14:13-14). "Be careful for nothing; but in every thing by prayer and supplication with thanksgiving let your requests be made known unto God. And the peace of God, which passeth all understanding, shall keep your hearts and minds through Christ Jesus." (Philippians 4:6-7). From where does the idea that we should not pray come? The critics truly believe that it is foolishness to ask for the Spirit of God to answer our prayers to know whether the Book of Mormon is true. I'm sure that many of them are sincere, but this is not a Biblical approach. They would rather have you believe that you should just know for yourself that the Book of Mormon is false without ever having read it for yourself or praying! Really? In light of the Biblical scriptures given above, what scriptural argument does the critic have for not praying to know the truth? None! The choice seems very clear: We can listen to the Lord, pray to know His truth, and hearken to the Spirit of the Lord . . . or we can trust the critic and refuse to pray and be led by that spirit which teaches a man not to pray.